You have described your music as ‘romantic.’ What is the definition of romantic for you? A lot of electronic music sits on a CD or on a vinyl and is kind of static. It’s there to create a night but not necessarily a mood that extends outside of a certain range of emotions, such as sexiness and buying alcohol-ness. Other than that limited range, it’s not meant to be emotional music. It’s meant to be evocative, but not emotional. So I want to be…emotional. Real romance has this kind of pull, a churning, butterflies in the stomach, feelings of rejection and jealousy and denial. Why not try to express that in music a little bit? Experimental electronica seems to be in the midst of a big upswing of energy in LA right now. Do you agree? What are going to be the trends in 2010? LA is very vibrant for its music, not only experimental electronica, but also all genres. Bands like Health and No Age have gotten a lot of prominence even though they do pretty weird music. And there will be more collisions as more and more of LA artists like Tokimonsta and Mono/Poly and Nosaj Thing, these somewhat younger musicians, are coming into their own. We are going to hear the most crazy, incredible collisions of sound. There’s a lot of psychedelic sounds coming from in this city and it isn’t just happenstance. The Doors came from a certain perspective, and Flying Lotus comes from a certain perspective, and Nosaj and the rest of us, we’re coming from a certain perspective and we can all work together…and that’s what 2010 is going to be. You’re going to see all these releases by these artists that are small in comparison to some, but what they’re going to do is going to be really large in terms of musical impact. You’ve released on a lot of different labels, each with their own personality, and you have an upcoming release on Brainfeeder, right? Is it an EP? When is that coming out? And what can we expect from that? March. It’s based on the Boxer Rebellion. I really enjoyed making a soundtrack to such an infamous moment. It was a war that happened between China and Britain primarily, and it was fun to make a soundtrack to something that is so old that there’s no possible way any of the music remains from that moment. It’s just this very factual, tragic moment in history and you can make up musical stories to occupy that space because of how grand the moment was and how tragic it was. The record isn’t entirely tragic, though; it isn’t entirely about hundreds of thousands of people dying. It’s just interesting to plumb those depths a bit. And Brainfeeder is building a really beautiful creative community. There are a lot of really creative people in LA, and they’re starting to circulate together. A lot of the musicians have finally broken down these barriers of genres. You see dubsteppers partying with beat guys, hip hop kids, indie rock kids, it’s all kind of swirling about. Low End Theory is a real nexus of this. But you go to some other cities like Tokyo, and every night has a VJ. Every show has a visual commentary on the music that is being played. Not so much in LA. Also, there’s a huge fashion industry in LA, and yet people aren’t really touching that. You have these dynamic performance personalities like Gaslamp Killer. It’s going to happen eventually, but why aren’t there fashion designers trying to make that guy an exclusive brand of clothing? Not something to sell on the racks, but he has personal sense of fashion and a dynamic spirit. It only makes sense that he’s gonna eventually, twenty years down the line, inspire a fashion designer, a novelist, people to do great works based on his energy. Why not now! And there are creative people doing it, so I just want to see more of it’s kind of colliding. We think of artists and musicians as being these raging individuals, which is true, but to what extent does a community of creative artists make a difference? Does that affect your work? Absolutely. I’ve made it a point on all my records to try to have collaborative work. There is something very unique about being alone in your studio. You’re “coffined up.” I don’t want to bring in too many Twilight metaphors, but for all intents and purposes you’re alone in your dark cavern, and you can start to be a little bit…insane, you know? Overanalyzing yourself. Overthinking. And overthought is one of the worst problems you can do in music; you are losing the spontaneity in what you’re doing. There’s a reason why you’re creative, so why not try to keep that moment? Having some other creative purpose usually forces you to work faster and not to over think. On that idea of work, the name ‘Daedelus’ means cunning worker. Obviously you are very talented, but how much of it is hard work? There are only two things: there’s hard work and luck. Nothing, nothing is talent. Where did your idea of Dandyism come from? When I was a kid, I was pretty obsessed with fashion, but I didn’t have any of idea of where to go with it. I tried all kinds of things: I was dying my hair, I tried being punk, being Goth, all in a schlubby-schlumpy way of having no money for it, no allowance, just borrowing clothes, cross-dressing and whatever. I was trying everything just to test out this kind of creativity. Eventually through getting into some historical things I learned about a guy named Beau Brummel, who the prototypical dandy. He was the guy that invented it all. He was a military guy, way back in the eighteenth, nineteenth century. He basically took what was really commonplace military wear and put his own imprint on it and made it into a personal expression. His life was his art. And musically I’m called to this idea that every little gesture you do in music has a meaning. You don’t repeat something eight times just because it’s supposed to be eight times or because that’s the form; you do it because it has meaning. You build up, and you have breakdowns, because they mean something. And he was that way with his life. He would dress a certain way to show off his mood, to say a certain thing, he would dip his pocket watch chain into tea so that it smelled a certain way and he would stuff his pockets full of lavender because he wanted that to be the first thing that happened when he took out his money clip. I think we all do that to a lesser extent right? You feel good and you put on a red sweater. But we do in unconsciously. To actually do it consciously- that’s art. And in the way I try to express Dandyism, it’s because it has this meaning, to be something more exceptional. I want my life to be something more exceptional because sure, we’re all wearing our schlubby clothes most of the time, but when we mean it, we can really make something of ourselves. We need more people who are bringing beauty and meaning into our world. Everyone does it unconsciously, they just don’t realize it. If people got a little more conscious about it, I think it’d be fantastic. A lot of people are working on revealing the hidden conspiracy theory of this or that, but my conspiracy theory is the banal, right? If things all get boring, then we die a little bit. So let’s just make everything beautiful and grandiose and exuberant and then we all win. That’s my conspiracy theory. 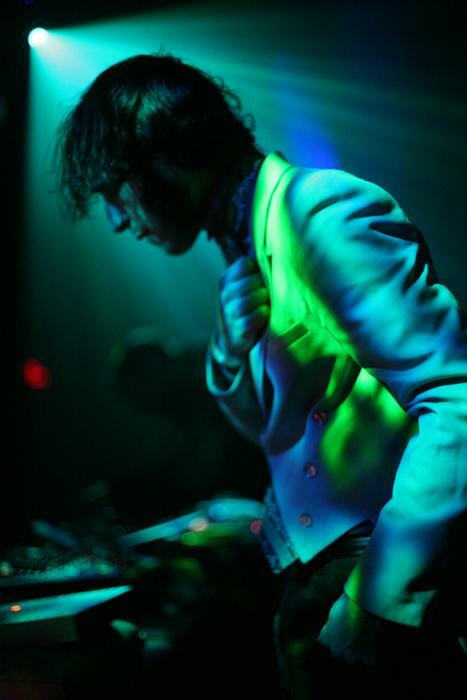 Click here for more information about Daedelus’ Magical Properties Tour. I walked away from this interview profoundly inspired by a true artist. This only an excerpt; if you would like to read the entire interview, please email me at shilonikelle -at- gmail.com and I will be happy to send it to you. This entry was posted on January 25, 2010 at 9:48 AM and is filed under Artists, Interviews, Music News with tags brainfeeder, daedelus, interview, los angeles, Low End Theory, magical properties, monome. You can follow any responses to this entry through the RSS 2.0 feed. You can leave a response, or trackback from your own site.